It’s hard for guys to find ways to stand apart nowadays where standing out is so popular, that it’s become sort of mainstream. Formal wear seems to be one of the hardest areas to set yourself apart, especially amongst young professionals. There’s always that one person who walks out of Top Shop with a bright red suit casual suit but unless you’re going a red carpet event spending that kind of cash on such a bold piece might not be worth it (at least not for me). There are tons of places we can go to get a suit that fits the bill but are we really satisfied with a $300 suit that’s been replicated a hundred times over? One of my worst nightmares is walking into an event knowing that the guy by the martini bar has the same blazer on as me. There’s been a demand for more personalized suiting options that won't break the bank and InStitchu has come to fill that void. Working a full-time job, living alone and trying to maintain some sort of social life means that my week is jammed packed and I hardly find the time to figure out what I’m going to wear the next day. I’ve often fantasized of a place that takes the scavenger hunt out of shopping in all aspects of life. We’re blessed with food delivery apps like Postmates and express coffee ordering through Starbucks but what about customizable clothing? If i can make my General Tso's chicken from Lucky Panda “extra spicy” I want to be able to order a blazer with a fun patterned lining! Well look no further… InStitchu literally does just that. If not already familiar, InStitchu is an Australian based online tailoring brand, founded by James Wakefield and Robin McGowan who saw the need for a more accessible way to get high quality, tailored clothing in a quick and painless way. 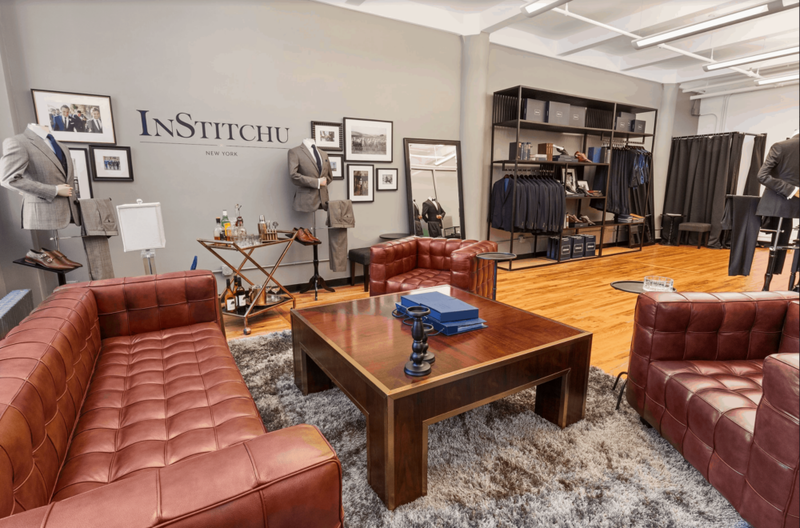 You may ask what sets InStitchu apart from all those other online tailoring companies or men’s clothing sites — my answer is the experience. They’ve set the bar high with white glove customer service and their omni-channel business model. Institchu delivers high-quality clothing in the hands of customers across the globe through their website and in-store presence with their dedicated showrooms (located in Australia, New Zealand, and North America). 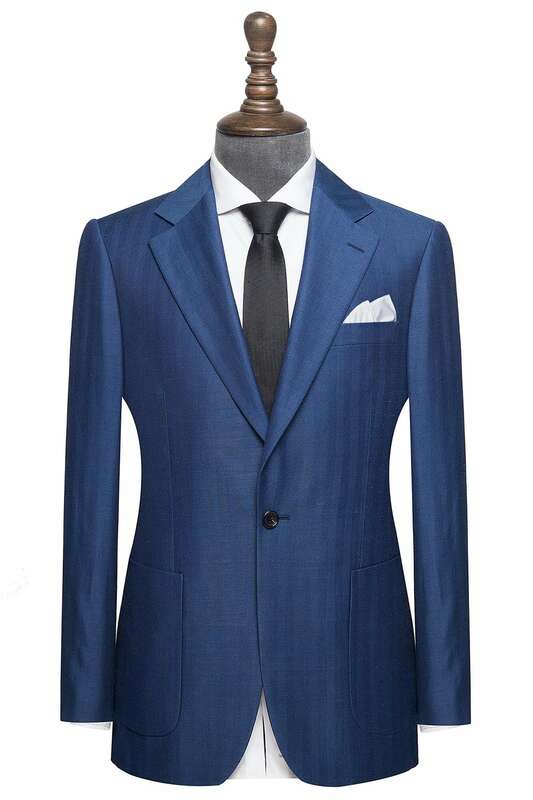 The brand allows you the option of ordering stylish suiting virtually anywhere. However James and Robin saw the importance of reaching their customers in a real life setting as well. This which ultimately led to the opening of their New York based showroom —located at 27 West 24th Street in Manhattan. 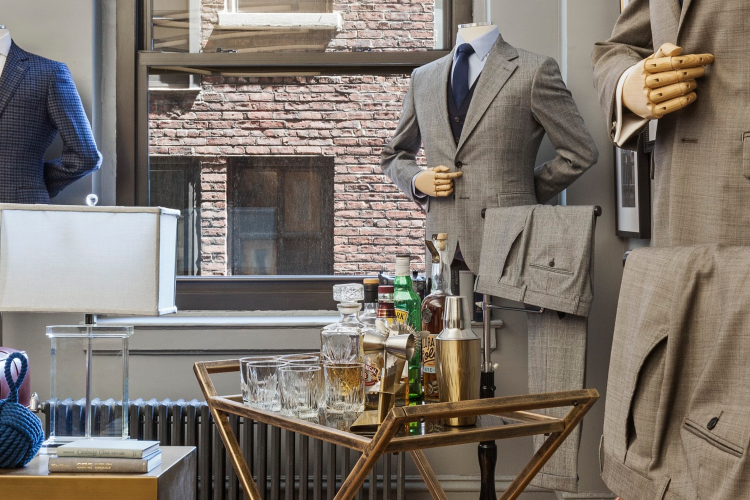 The dedicated showroom is a mecca of suiting solutions. Their beautiful old-world style stays true to their aesthetic throughout the showroom. I was greeted with a gentle smile and firm handshake and was offered a variety of refreshments ranging from whiskey on the rocks to hot jasmine tea. The fitting and customization process (which tends to be stressful for most of us) turned out to be the most seamless part. A dedicated stylist was there to guide me every step of the way where I selected everything from the colors and fabrics all the way down to what type of buttons and pockets I wanted. About three weeks after the fitting, my new, custom-made suit arrived at the showroom where I tried it on for the first time. I was a bit nervous with how the suit was going to turn out but was pleasantly surprised with how everything fit and looked. Plus now that InStitchu has my measurements, I won’t have to take time out of my busy life to order a fresh new suit ever again (which might just be the best part). Want to get your own custom suit? Visit InStitchu.com or their showroom at 27 West 24th Street in Manhattan. Bryan Jackson resides in the Lower East Side of Manhattan where you can often find him on the go with a large iced coffee in hand. When he's not working, he's either at one of his favorite brunch spots with friends or trying to make an early workout class.